Even if the wild dolphins of Panama City are considered as “friendly” because they approach boats and swimmers, it would be premature to say that the human/dolphin interaction benefits both sides. Since scientists have not yet been able to systematically monitor the life of the wild dolphin population in the Panama City area, we cannot measure the full effect of their interactions with humans and we cannot qualify it either because even though several groups of scientists have tried to assess the composition, size, health status/level of stress of the local population, it is practically impossible to monitor or even to identify a whole population in this area as would a consistent study require since the animals are in constant motion in a very large geographic area. What is certain is that the local human community in Panama City is benefiting financially from the interaction with wild dolphins because almost every recreational and tourist oriented business is using them as an attraction. This brings about a very important question for our community: how do we make sure that dolphins are being allowed to strive and flourish so that they can continue to be an asset to this area? At Water Planet since 1995, we have been trying to find that fine line between inter-species exchanges and harassment. No consistent research has been published so far about the impact on the Panama City wild dolphin population of human activities, both industrial and recreational. Until such data is available, it is very difficult to select and to apply conservation strategies. Some of the adverse conditions resulting from industrial activities could be silting of the St. Andrews Bay waters and algae blooms causing grass beds die offs by lack or limitation of photosynthesis. Typically, deforestation would be the origin of this problem. Pollution by toxic runoffs could also be a problem in our bay waters. We have several important industrial plants right by the bay, east of town. Sewer lines leaks or ruptures and agriculture fertilizers runoffs are also a serious concern. Residential and commercial developments by the bay disrupting the natural seashore (Spartana grass being an efficient natural filter for runoff waters) could also be responsible for drastic changes in the bay water chemistry promoting algae blooms.The Friends of St. Andrew Bay is probably the most reliable source of information as far as data on the St. Andrews Bay marine eco-system. Dolphins are an excellent indicator of the health of their (and our) environment because just like us, they are at the top of the food chain. Their fatty tissues store toxic elements like PCBs and heavy metals. 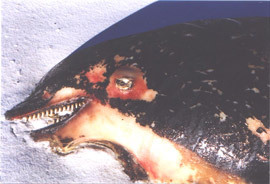 Even though in our opinion, the problems described above are much more serious and threatening then the impact on wild dolphins resulting from the interaction with recreational activities like boating, sports fishing, swimming and snorkeling, the nature of Water Planet’s programs is limiting our area of expertise to the latter field. Consequently, since 1995, Water Planet has looked for and actively encouraged and supported projects focusing on the effects of human interaction with wild dolphins, on bottlenose dolphin population assessment, distribution, photo identification and behavior in our area. 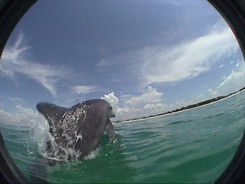 In 2004, Wanda Jones, a University of Florida doctoral researcher, has published the only serious study focusing on the interactions between wild dolphins and humans in our area: “Wild Bottlenose Dolphin Behavior And Interactions With Humans In The Nearshore Waters Of Northwest Florida.” This study can be obtained with UMI Dissertation Services. This particular research looked at the behavioral ecology of all the dolphins that could be found inhabiting the Bays and Gulf of Mexico waters up to 3 miles offshore from Cape San Blas to the western part of Choctawhatchee Bay in Destin. Data collected included habitat use, population distribution and abundance of dolphins within the study area, movement patterns, pod associations, and behaviors exhibited by dolphins habituated to human presence and those that are not habituated/interested in contact with humans. A behavioral activity and time budget was created for the dolphins observed in the abovementioned study area. This comprehensive study, considerably improves the understanding of the Panama City wild dolphins and of their interactions with human activities. Population size estimate and characterization of the demographic parameters. Survival, birth and mortality rates. Distribution in space and time of the animals in the study area. Influence of the different zones and/or time of day. Seasonal influence on the likelihood of observations. Usage strategy of the study area. 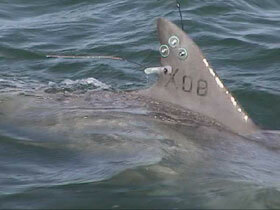 Another study was conducted on an adjacent population (St. Joseph Bay) between April 2004 and July 2005. 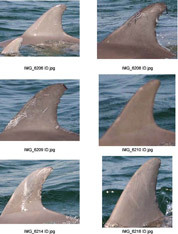 “Short- term ranging patterns of bottlenose dolphins (Tursiops truncatus)in and around St. Joseph Bay, Florida”. The methods for this study included capture and release, tagging and attaching VHF radio transmitters, which are in our opinion somewhat invasive and potentially dangerous for the animals. Apparently, several dolphins were killed in the process. Since Water Planet promotes encounters with wild dolphins in these particular zones since 1995, we are very interested in finding out how the wild dolphins are absorbing the impact of their interactions with human activities. We are particularly interested in the issue of provisioning (feeding) and its potentially negative impact on the dolphin population since we believe that for the most part, wild dolphins exposure to harassment increases proportionately with the dependency created by human provisioning. We know for a fact that so far, there is no negative impact on the human population in Panama City resulting from humans feeding wild dolphins. 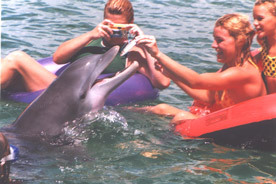 There are no records of any serious injury inflicted by a wild dolphin on a human in the Panama City area but due to the escalation of feeding and petting by the tour industry in 2012, certain animals have started to show rough behavior with swimmers while being fed and touched. This certainly is an area of concern, which has participated in the creation of the BADTOFEED Program and its release in Panama City Beach in April of 2013. Nevertheless, we are still not convinced that a respectful in-water interaction without provisioning or petting the animals has a negative impact on the local wild bottlenose dolphins.. Until proven otherwise, we still believe that awareness programs such as ours can participate in the area’s wild dolphin conservation. We have noticed that only a certain portion of the dolphin population approaches boats and swimmers and interacts with them on a regular basis. This interaction is partly motivated by the hopes of receiving handouts but we have also noticed that only a certain percentage of the total population are interacting with boats and swimmers on a regular basis. 2. What factors influence the animals change of behavior including but not limited to provisioning. 3. To what extent can law enforcement, changes in policies, new regulations and educational programs minimize the negative impact in recreational human/dolphin interactions. After 18 years in the making, we are finally launching our BADTOFEED website. It is a concerted action within the Dolphin Tour Industry aimed at promoting safe and respectful dolphin encounters in the Panama City area. Water Planet is also interested in and has actively supported a doctorate research project by Kristin L. Stewart, a Florida State University, Geography Department student investigating human-dolphin encounter geographies in the marketplace today and how Government Policies can influence the public’s perception of wildlife and people’s relationship with nature. The wild dolphins of Panama City have been used by tourism as an attraction for over 20 years. Their charisma, abundance and accessibility have made them a prime target for numerous tour operators. 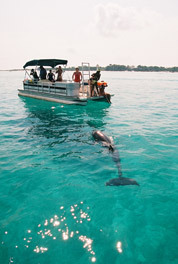 In our area, most travel magazines, tour brochures and promotion pamphlets use dolphin images to market their services. Several tour businesses are very well organized to “sell” the wild dolphins of Panama City, who have become a valuable resource for the community, much like our area’s fish stock is an asset for the sports fishing industry. Contrarily to the sports fishing community, who is actively working with government agencies on managing the resource they are drawing on (artificial reefs projects, catch and release strategies, % of fishing license fees re-invested in the management of the resource, fishing clubs and associations, etc. ), there seems to be no attempt by the local “dolphin users” in our community to take responsibility for organizing and managing the “usage” of wild dolphins. 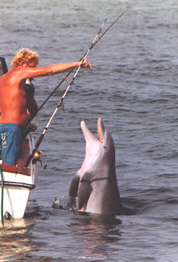 While the sports fishing industry and US Fish and Wildlife Service work in close collaboration on resource management issues such as education campaigns, seminars, etc., there appears to be no effort made whatsoever from either the resource managing agency responsible for wild dolphins (National Marine Fisheries) or from the local businesses using dolphins as assets in their activities to communicate or to work together on finding solutions to the potential problems associated with with human wild dolphin interactions. No association could be found in Panama City of the businesses using wild dolphins as the primary or secondary focus of their activities until April of 2013 when Water Planet launched the BADTOFEED Program. 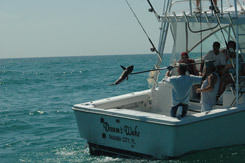 While it is widely recognized and accepted that sports fishing is an important part of Florida’s economy, the rise and expansion of the wild dolphin tour business is not as readily acknowledged. Is it because it is still regarded as marginal or not important enough to deserve more attention? Or is it the result of a climate of doubts existing because the MMPA (Marine Mammal Protection Act) does not shed enough light to clarify the definition of harassment in a sensible “species and area specific” manner, making wild dolphin tours a questionable activity from a legal standpoint? It would seem that so far, the MMPA addresses mainly whale watching issues but is not fine tuned enough to make the distinction between endangered and protected species and other less sensitive and vulnerable species. An important contradiction also exists between policies issued by the government as far as harassment is concerned. 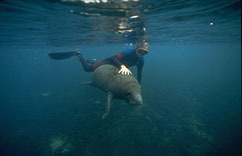 While Fish and Wildlife has promoted and encouraged the in-water interaction between tourists and the West Indian Manatees (on the threatened species list) for several years in their natural habitat for education and protection purposes , National Marine Fisheries on the other hand is trying to discourage all individuals and programs promoting interactions with bottlenosed dolphins in the wild. The bottlenosed dolphin is far from being endangered. After they have widely circulated documentation such as this (PDF file) for years, Fish and Wildlife is all of a sudden discouraging the public from swimming with manatees in the wild, possibly because of the pressure they were getting from “swim with the wild dolphins” advocates. However, the “swim with wild manatees” business is huge (over 10 pages of results for a Google search with the key words “swim with manatees Crystal River”. The “swim with the wild dolphins ” programs are fair game because they pose a threat to the Captive Dolphins Industry (see below). For lack of clear provisions in the Law (MMPA) NMFS has issued strict guidelines expressing the Agency’s recommendations for the interactions with marine mammals in general. The lack of conclusive research data on the impact on the different bottlenose dolphin populations in the US of tourism related interaction possibly also contributes in delaying a decision in the pending “Proposed Rulemaking” by NOAA (National Oceanic and Atmospheric Administration) concerning “Preventing Harassment From Human Activities Directed at Marine Mammals in the Wild”. A worthwhile effort has been made by The Wild Dolphin Foundation to examine, discuss and explain the sensitive issues of how human activities can affect biodiversity and marine mammals in Hawaii in particular. Mental delusion where the subject thinks that dolphins are always there when you need them, are always smiling, are all good natured pets that will jump through the hoop, feed out of people’s hand, give you a dorsal tow and roll over to get a belly rub. When it comes to dolphins, environmental awareness has become the driving force pushing most educated families to choose encounters in the wild rather then a pre-fabricated experience even if it means being more patient and facing the possibility of a no show. As a response to this trend, the captive dolphins industry is investing in creating team parks with more personalized encounters in a setting that looks more and more like nature. Other facilities train captive dolphins to swim out of their pans into open water where they interact with the customers. They call this a “semi-captive” experience. Some also pretend that the animals have the choice to leave or to stay. Anybody familiar with animal behavior knows that wildlife tends to avoid human contact unless there is a dependency. In our opinion, semi-captivity is nothing short of wishful thinking or just another sales pitch targeting an environmentally minded market. The so called “semi Captive” swim with the dolphins programs are proliferating throughout the world, especially in the Caribbean under the umbrella of so called “education and conservation”. But the conclusion of all the politically correct environmental organizations is clearly expressed in this statement by the Belize Audubon Society, who is opposing the inclusion of a “semi-captive dolphin swim program” in the Spanish Bay project Quote: “Rather than teaching respect and care of biodiversity and natural ecosystems, encounters with wild animals held in captivity, convey the message that wildlife is there for humans to exploit for their own pleasure and financial gain.” Unquote. – Look for, encourage and study serious scientific publications examining the potential negative impact if any of human/dolphin interactions resulting from recreational activities. – Propose and participate in the implementation of sensible conservation and protection strategies. Note: The content of this page shows the issues we have been focusing on between 2007 and 2013.